Welcome to my FET week. A few of the cards I would have put here were already taken -- it's probably better off that they were reviewed earlier. Threatening Roar is basically the new Waboku. It has its own pros and cons. *They can't attack the monster -- this means that a flip effect you need to go off on your turn can safely do so. This lets the Cyber Jar be a suprise, so you can hopefully set up for a major swarm...or play the Delinquent Duo, flip your Magician of Faith, and flip it again. *D. D. Warrior Lady can't still go through the monster and RFG it like is the case with Waboku. *It can be chained to an opponent entering the battle phase, so it can serve the same purpose in that respect. *You lose the offensive kamikaze -- where you flip Waboku on your own turn, ram your monster into theirs that has equal ATK, and yours lives. *Waboku is a better BLS defense -- if you use Threatening Roar, an attack never happened, so BLS can still use his removal effect. If you use Waboku, BLS attacks, doesn't kill anything, doesn't get a 2nd attack, and can't remove a monster from the game. Overall, it's still a great card. In major stall decks (Final Countdown, anyone?) I could see Waboku and Threatening Roar being paired to make one heck of a stalling team. The only thing that drags this card down is it's -1 card advantage -- you're trading 1 card for 1 attack-free turn...that, and this is a horrible topdeck as although it protects you, it puts your opponent one more card ahead of you. If you activate this card, your opponent cannot attack you that same turn. So if your opponent uses Heavy Storm and you chain this, he won’t be able to attack. This can definitely be better than Waboku in some situations; for example, if your opponent attacks with a D.D. Warrior Lady and you use Waboku, he can still remove both monsters. If you have a Flip Effect set, he can still attack and flip it. But with Threatening Roar, neither of those is a problem. Now, there’s some confusion as to when Threatening Roar does and doesn’t work. If you activate it in response to an opponent’s attack, the attack will still go through, and this poses quite a problem sometimes. Usually, a player will say something like “I summon Gemini Elf and attack.” If that happens to you, you’re fully entitled to say “Before you end your Main Phase, I activate Threatening Roar,” because remember: a phase doesn’t end until both players agree it ends. That said, Threatening Roar is a great card. In my opinion, it’s better than Waboku (and yes, I know the argument could be made for either card. But hey, these reviews are all subjective anyway). So…yes, very rentsy and such. Welcome to a week of “Broken” FET Cards. This week we’ll be reviewing the 5 best un-reviewed cards from Flaming Eternity. Today’s card is Threatening Roar, the 7th-9th deckable Waboku. Roar’s effect is simple; during the turn it’s activated your opponent can’t declare an attack. So it’s a bit like Waboku in the sense that it’s a chainable Trap that saves your monsters and it’s similar to Negate Attack in that your opponent won’t be able to attack. The only dilemma with Roar is that if you activate it in response to an attack, it’s to late to stop the attack’s declaration. So you have two choices: 1) activate Roar in the Main Phase 1, or, 2) ask for a replay. Now why would you ask for a replay? Well because most players don’t usually announce their transition through Phases it is difficult to chain things to Phase changes. So if your opponent declares an attack you want to stop and you’ve yet to activate Roar, say that you chain Roar to the start of the Battle Phase. If your opponent argues that it’s too late, say that you never had the chance to respond to the Start Step of the Battle Phase. Evil huh? And if your opponent still complains tell them to look it up in the rulebook. All in all, Roar can work in any Deck Waboku can, which is basically every Deck. I personally would use Waboku over Roar only because with Waboku, Flip Effects can activate and you can survive a kamikaze. Of course it’s all about preference, so use Roar if you like it better. Advanced: 4/5. It’s a Chainable Trap that stops attacks. What’s not to love? Just be sure to activate it prior to the end of Main Phase 1 so as not to start an argument. Art: 3/5. Meh. It’s Manticore of Darkness scaring Behemoth the King of All Beasts. I don’t think the “King of All Beasts” would in reality be scared of anything other than the “Deity of All Beasts”, but that’s just me. Dark Paladin Please add this to my review to threatening roar for yesterday, thank you. If you could actually delete it completely and change it to this, I'd be much appreciative. This card is good, it's got some potential going for it. One turn with your opponent not being able to attack may not seem like much, however it can be all the time you need. You can protect your monster(s) from DD Warrior Lady or even save them to be tributed the next turn. This card is also better than Negate Attack in the fact you can chain to it if you need to. In a stall deck, if you played three of these in a row (one per turn) your opponent wouldn't be able to attack for three turns! Isn't that cool? This is another one of those cards that ranks a 9.5/10 on the annoyance scale. Coin Flip Meet Waboku v.2. In all honesty, both this and Waboku are incredibly useful defensive traps and both have their individual downsides and upsides. I'll be comparing the two because, well, I can. Waboku is a chainable trap with no cost that stops all battle damage. This means your monsters get flipped up if attacked and that the battle still occurs, meaning that effects like D.D. Warrior Lady and Mystic Swordsman LV2 still occur. But it has offensive capabilities present in the fact that you can activate it during your turn. Meaning that you can ram a Spirit Reaper or Magician of Faith into their Reflect Bounder and come out of the deal a winner, or just ram your Gorilla into their VLord. Hurah. Scaring Roar/Threatening Roar is a chainable trap with no cost that stops the attack from occuring at all. On the upside, no MSLV2 or D.D. Warrior Lady. On the downside, no offensive capabilities. So if you're running a deck with 12365918 monsters that are meant to be kept f/d, you get 3 of Threatening Roar or Sakuretsu Armor because you REALLY don't like stuff like MSLV2 screwing up your plans. If your deck is more offensive and you aren't using Sakuretsu or Bottomless, this is a perfectly good option (as is Trap Hole, but noone listens to me on that one). It's a solid card in Traditional and Advanced, but Advanced focuses more on field control than hand control, which is what Waboku and Threatening Roar attempted to go with – protecting you from a dropped Donny Z or Spirit Reaper after they Heavy Storm or something. Once again, classes necessitate that I be very brief with my reviews. I wasn’t go to review at all, but there seems enough dissent in at least a few of the CotDs this week to warrant my participation (e.g. I disagree and can’t keep my mouth shut or fingers off the keyboard). Besides, I really do need to shorten my average review length. Wow. Another way to almost completely ruin Gravekeepers. Is there some über-unbeatable deck using them that the general dueling public is unaware of? Seriously though, this cards effect is pretty good. Yes, it is annoying to have to sack a Dark Monster with an ATK of 2000 or more to activate this Trap, but we do have some good options that can be added to almost any deck, like Zombyra the Dark Hero (a.k.a. Wannabe Spawn). 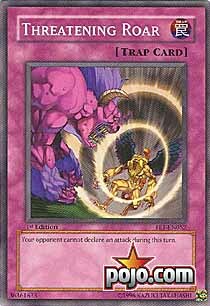 Destroying all opposing Monsters with 1500 (or less) ATK that your opponent has in play, in hand, or draws for the next three turns has potential for a huge reward. Had this come out when the game was young, it wouldn’t have done much good. Now, though, we have so many strong support Monsters with nasty effects but small ATK scores. D.D. Warrior Lady, the Jars, most Attribute (and Type) searchers, and several theme-specific Monsters get trashed. You do need to nail two to break even, but the potential return is staggering. There are ways around this effect, though. Cyber Jar, for example, “picks up” cards instead of drawing them, so those Monsters are safe. Still, for depletion or control decks, this is a good choice to main deck (assuming you can adjust to meet the requirements to use), and for most decks, it’s a decent side deck candidate since it can mess up things like Weenie Rush and Gravekeepers. Yes, I mentioned them again; only one Gravekeeper’s Monster has more than 1500 ATK, and they excel at swarming. Just be careful with deck’s that feed off the Graveyard in some manner… like Chaos. Somehow I think discarding their Don Zaloog and Shining Angel from hand will really upset those (and those are just random legal targets I’ve seen; if no serious deck uses them, insert the right cards XD). Traditional: 4/5-This assumes a deck geared towards taking advantage of this… which to be fair, would qualify most decks that can add that 2000 ATK Dark Monster, since this is great for aiding in a Yata-Lock. You might clear their hand a field in one shot! It also could kill their copy of The Bird. Advanced: 3.5/5-This is a general rating, so bear in mind it is still more useful here. I think it makes a strong side deck candidate, again assuming you can meet the relatively simple requirement. Two copies of this and three Zombyra might seem like a lot for, say, an ALO deck, and it is. For Chaos and Warrior Chaos, though, it’s practically nothing. Limited: 1/5-It’s possible I messed up, but I didn’t find any non-Fusion Monsters in this set that meet the Tribute requirement. Be pretty nasty in a Starter deck (which usually adds one or two boosters) though.